The bigger Panny's plasmas get, the more we are drawn to them. It's a true five star performance and that includes the price. The all-black TH-50PX70 is distinguished from previous Panasonic TVs by the image processing power it packs under the name Viera V-Real2. It carries a scaling processor to receive native 1080p sources or upscale lower-resolution sources; over 3,000 colour/greyscale grades; a huge claimed contrast of 10000:1; advanced 3D colour management; motion pattern noise reduction; and a sub-pixel controller for sharper edges. These come with Panny's legendary Real Black Drive for better black levels, which is now boosted by a Deep Black Filter. Connectivity is good, with twin HDMIs, component video inputs, and a PC jack. It's dumped the old analogue sockets. The HDMIs are 'Viera Link' compatible for hooking up to compatible kit. Unleashed on the new HD DVD of Mission: Impossible III, the 50PX70 continues Panasonic's plasma winning streak. With a resolution of 1366 x 768 it does as good a job of rendering the reams of detail as any non-Full HD TV we've seen. It also does a classy job of reproducing a convincing black level during dark scenes like the assault on the Shanghai skyscraper, reminding us of plasma's advantage here over LCD. The bright colours of the Shanghai night, meanwhile, are rendered with genuine vibrancy, yet at the same time the skin tones of the actors always look impressively natural. Common plasma flaws such as dotting over moving skin tones and fizzing over dark areas are both suppressed, and colour blends are largely free of the 'banding' effect lesser plasmas produce. We're also struck by how sharp moving objects look as they move across screen. Panasonic has souped up the 50PX70's audio too, so you can enjoy a soundstage that, if a touch thin, is almost on a par with the pictures. 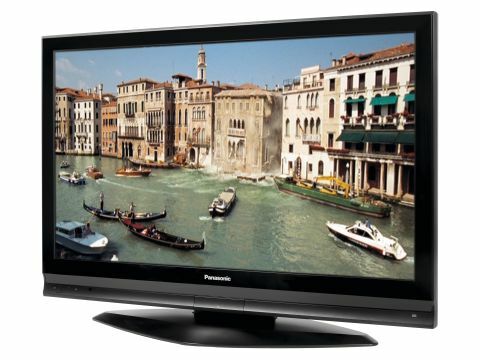 With the 50PX70, Panasonic again sets the pace in the plasma world. It wouldn't surprise us if it leaves its rival contenders trailing.